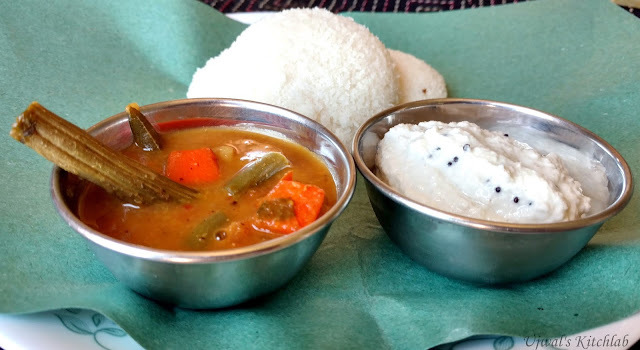 Idli Sambar is a healthy and nutritious South Indian breakfast since it has a good dose of carbs from the rice, protein from the dal and generous portion of veggies. Most of the Indian households have this for breakfast atleast once a week. Sambar can be easily made with ready made sambar powder available in Indian grocery stores. I prefer to make them fresh at home as nothing can beat the aroma of freshly made powder. It is very easy and don't get intimidated by the long list of ingredients. Sambar can be served as a side with hot fluffy idli's , a bowl of steaming rice or with crispy hot vadas dunked in it! This recipe is from my friend Naina . Her sambar is a favourite with us friends. This is slightly different from our konkani style sambar but very tasty and aromatic. I usually make this sambar with idli's. Feel free to add eggplants, beets in this recipe. I did not have them handy when I made them. Try not to skip the raddish as it elevates the taste of sambar. I was not a big fan of radish until I tasted it in this recipe. Try it and I am sure you will love it. 1) Pressure cook toor dal with beans, potato, raddish and carrot in sufficient water for 3 whistles. 2) In a small pan roast the spices by heating a tbsp of oil. Add in coriander seeds, cumin seeds, chana dal, urad dal, mustard seeds, methi, pepper corns, red chilli, chopped onion and grated coconut and fry until golden brown. Take care not to burn it as it would ruin the taste of sambar. Cool and make a paste with tamrind, turmeric powder and little water. Keep aside. 3) Heat oil in a pan big enough to hold the sambar. Add mustard seeds and let it splutter. Add in the hing, curry leaves and red chilli. Add in onion pieces. Saute until pink. Add in cubed tomatoes. Let it cook covered until mushy. Add the ground masala paste and fry it well for 4-5 mins. If the paste is too dry add little water so that the masala does not stick to the bottom of the pan.Add more water and thrown in the drumstick pieces. Cover and cook until it softens. Add in the boiled dal with veggies, jaggery and salt. Cook on slow flame until the sambar boils really well. Add generous amount of finely chopped coriander leaves along with its stems . Give it a rolling boil and switch off.